Stitched Together: Episode 4 is now live - Does Anyone Fancy a KAL? Episode 4 is now live - Does Anyone Fancy a KAL? Summer of Lace & Beads KAL with The Knitmore Girls. 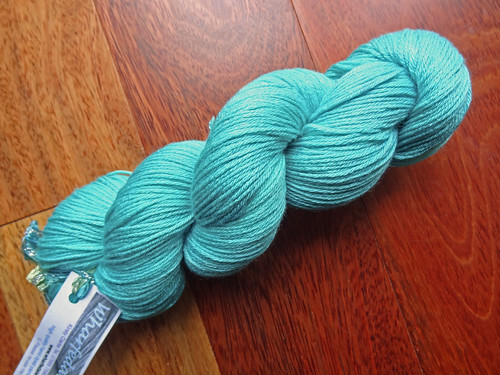 I've got yarn from stash, Wharfedale Woolworks Falkland Merino/Silk 4 ply in Creme de Menthe, and I've bought beads. I'm planning on knitting Glitz at the Ritz by Helen Stewart, from Knitty, First Fall 2013. Minerva Crafts Review Project in King Cole Bamboo Cotton - King Cole 3324. 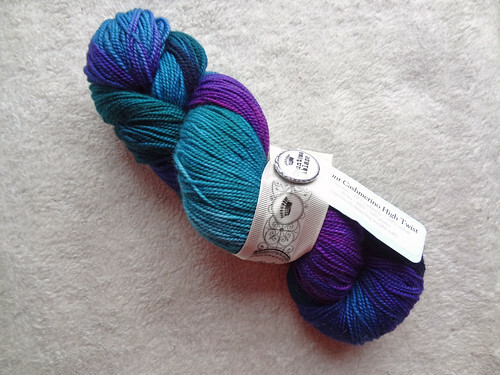 Trillian by Martina Behm, using Deeply Wicked, from Splashed Out in Episode 3. I've entered it into The Fat Squirrel's Orange KAL. Spun the Easy Knits Polwarth/De-Haired Camel in Exterminate from Splashed Out in Episode 3, I added it to my entry in the Orange KAL in the hopes that the Orange levels would be boosted. Blogged about it here. 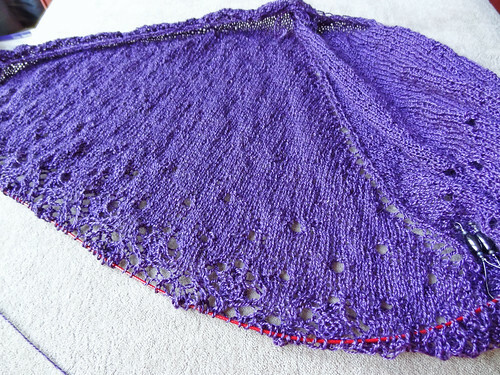 Dew Drops Shawl is now being worked on - slowly. Henslowe, after seeing Emily's on the Watcha' Swatchin' Podcast. Using Malabrigo Sock in the Abril colourway, from stash. Spinning Mallard fibre from Hilltop Cloud, talked about in Episode 3. It's a lot less "grippy" than the fibre I've spun so far, but it's going faster too. I blogged about it here. Being ruthless with my patterns from magazines collection. Pattern Splurge - Henslowe, Howl Cat, Wandering Wildflower. 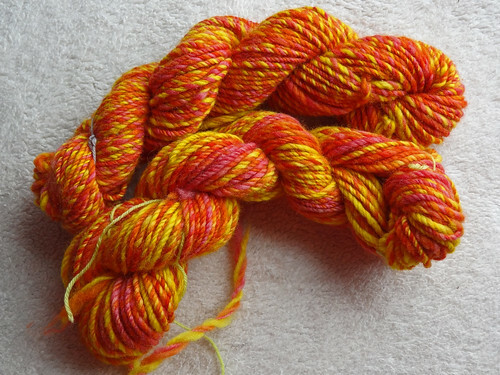 Countess Ablaze Polwarth, blogged about here. Fondant Fibre rolags and Icelandic fibre, blogged about here. iSpinToolkit app, recommended by Rachel of Reecie's Pieces Podcast. I also recommend the Yarn Raising Podcast with Melia, who talks mainly about spinning and is a great source of information and inspiration. 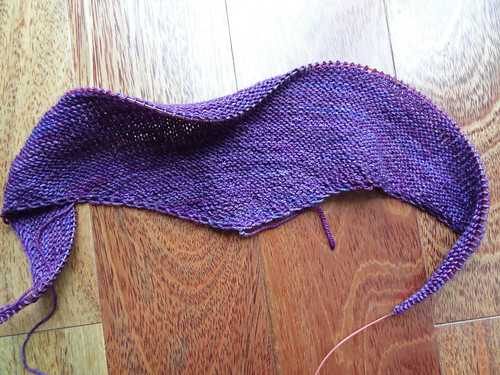 Wanted to talk about the possibility of doing a KAL/CAL that involves using patterns from the library. Let me know in this thread what you think. If you have any podcast or blog recommendations, please join the Ravelry group and add to this thread. If you are a member of the group, I will add your blog or podcast to the list if you leave the details in the same thread.